The publisher Götz Kubitschek, his wife Ellen Kositza and an employee were attacked and injured yesterday evening in the Sachsenhausen district of Frankfurt by three masked attackers. Kubitschek's publishing house has been exhibiting at the Frankfurt Book Fair. The attackers struck at around ten in the evening in front of a pizzeria. According to the Neue Zürcher Zeitung [DE], Kubitschek was jumped from behind, kicked in the head and verbally abused by name, his wife fell to the ground and was jumped on, his employee was hit in the face with a bottle. The police are investigating. Götz Kubitschek and his wife Ellen Kositza at the Frankfurt Book Fair 2018. Image: PI-News. Oh, by the by – we ought to mention that Kubitschek is one of these right-wing extremist knuckle-draggers of whom we should be so afraid, according to the German government. Our readers may remember our report of the excellent speech he made in Cottbus in February this year. So far, October has brought us an astonishing level of derangement in the public discourse in the USA – simultaneously or by turns vulgar, tasteless, inappropriate and embarrassing. 'Irrational' is the kindest word we could use. The mid-term elections in November will solve nothing and probably make things worse. It is difficult to see how this foul-mouthed country will ever be repaired. Britain, stumbling towards Brexit, is becoming ever more authoritarian, in small things and in large. The main concern of the moment seems to be with what goes into vegan sandwiches – leading to the conclusion that the basic BLT is always the healthiest option. Admittedly, the pig, the lettuce and tomato might disagree. The British media are full of allegedly intelligence-sourced stories of fiendish Russian agents. The stories themselves make no sense at all. Germany is turning into demoland, with its immediate destiny hanging on the outcome of the Bavarian elections tomorrow, Sunday. Our motto is still holding up, though: in Germany, politically, nothing ever changes. France is business as usual: many initiatives but no action. If you think you will be able to weaken the French unions – think again. The political chaos in Italy really is just business as usual. Sweden is a lost cause and has been since the IKEA catalogue embraced diversity – disposing of its USP at one stroke. The formerly Catholic countries of eastern Europe seem to be holding their own so far. The IPCC has published an 'interim report' into global warming, the findings of which no one is allowed to question in public media. Around Europe, vegans are developing a taste for smashing up butcher's shops and intimidating workers in the meat business. We are told that the population of the world must be reduced dramatically – NOW! A suspicious silence hangs over the precise implementation of the solution. It appears that doctors have been performing gender reassignment on pre-pubertal children, more or less on demand; ditto manipulations to produce gender-selected babies. Enough of this nonsense. ENOUGH! 'Out of which things seeking an exit'. 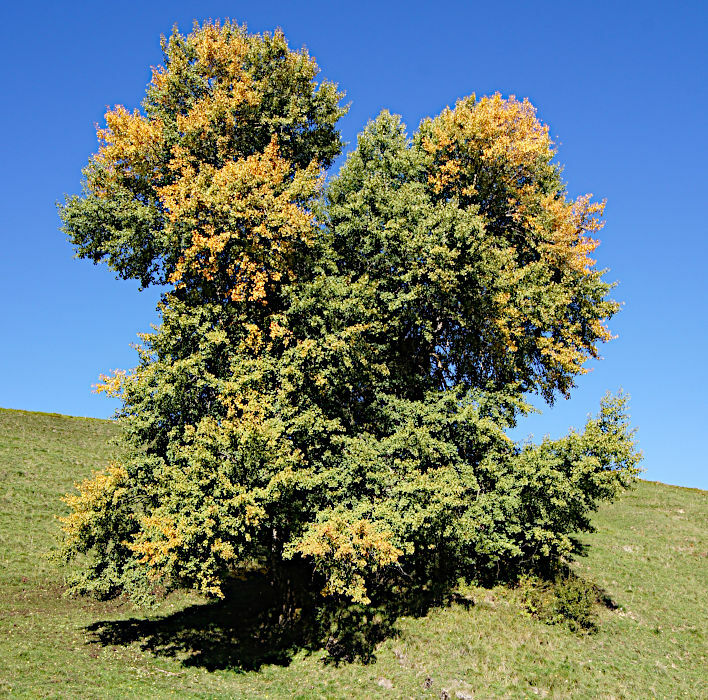 Let's go and see what our aspen is doing midway through this goldener Oktober in Switzerland. 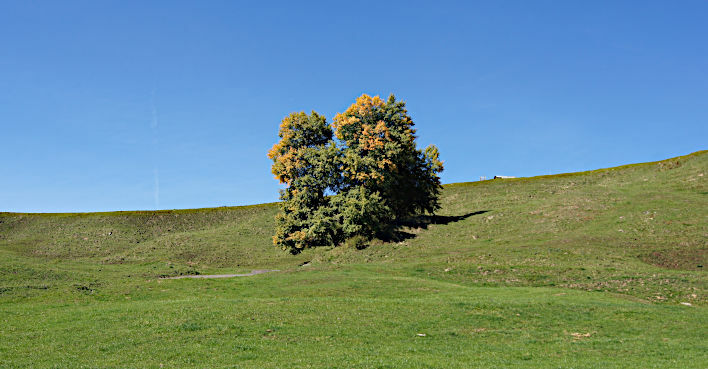 This tree was probably here when Napoleon Bonaparte swept his arm across the European chessboard, scattering the pieces. It will still be here when we are all forgotten – unless, of course, some green lunatic decides that a windturbine would look more fetching in this isolated sweep of horizon near the hilltop. Switzerland is busy marketing its Swissness and simultaneously destroying itself. It appears that the new generation of visitors no longer wants peace, alpine meadows and peaks; the new generation wants thrills: scary walkways and dizzying lookout points, canyoning, bungee jumping, rafting and ladder scaling. Where once there was a network of hiking routes that were largely left in a natural state, networks of biking routes have been added as well as places to grill and to camp. Walkways and bridges are stretched across previously untouched valleys. Switzerland is erecting more and more cable cars to bring visitors, summer or winter, into isolated places. However, one cable car is never enough – whole regions and valleys have to be linked together for the projects to make economic sense. Even here, a little way to the right of our tree, outside the wide-angle view, there are the buildings and the pylons of a small ski lift that at this altitude just stand around unused for eight months of the year. Every increase in accessibility is a trade off against Nature. Nowhere is safe: there is helicopter sightseeing that will take paying visitors anywhere. The old Junkers Ju-52 aircraft that crashed recently on the Piz Segnas above Flims killing 20 people was one of a fleet of three that flies sightseeing excursions all over the Alps. Setting out from their base in Dübendorf they thunder along very slowly at very low altitude over all the last, quiet places of Switzerland, giving sixteen or so passengers a good view of these silent places. During good weather these planes pass over us sometimes a couple of times a day. Silence and remoteness count for nothing when 16 people will pay to intrude noisily into it, smartphones at the ready. It is telling that the commercial pressure of tourism is so great that the flights were allowed to restart only two weeks after the crash, before anyone had any idea of the cause of the crash. Switzerland has decided to switch off its nuclear power stations sooner rather than later. It now has to squeeze every bit of energy it can from hydro, wind and solar. The exposed places will be covered with windfarms, every south-facing surface with solar panels and trenches will be dug across primal land for the cables. It's amazing what comes into your head when you are looking at a tree. 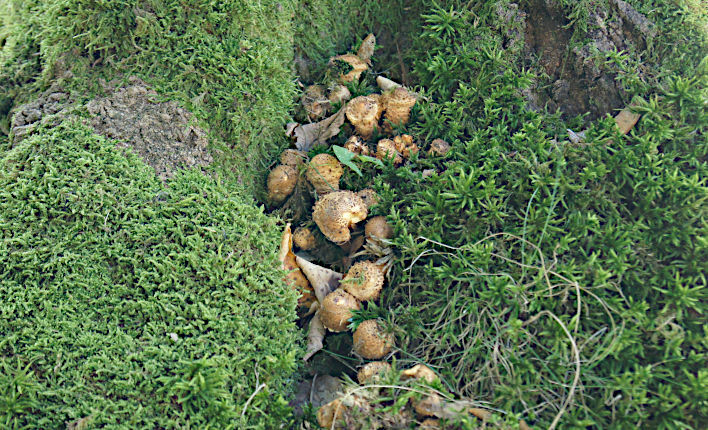 In its branches and among and around its root system the aspen plays host to many companion species. We think of synergy and ecological balance, too, something that is missing in the modern Switzerland. You know it's October when the early Christmas shopping advertisements start to appear and the Envy-of-the-World™ reminds the British public of that impending British winter festival, the annual winter collapse. It's the fault of all those old people, apparently. We are also told – with some pride in achievement – that the waiting list for routine treatment is the longest it has been for 11 years, with 4.15 million patients now hanging around waiting to be treated. All the characteristics of communist collectivist organization are on display in the NHS. Not only the general uselessness and incomptence in the performance of its core task, treating the sick, but the profligate spending needed to cover up the defects and inadequacies caused by previous profligate spending. But our readers know that there is not enough money in the world to keep a soupkitchen running in the manner to which it would like to be accustomed. At the same time the propaganda machine clanks onwards – the only thing that does work in this shambles. In addition to the usual Stakhanovite praise of the armies of heroic workers doing everything they can against terrible odds, those unfortunates who watch the communist state broadcaster, the BBC, are currently enjoying a cooking competition that celebrates '70 years of the NHS'. Eton Mess in a bedpan, anyone? 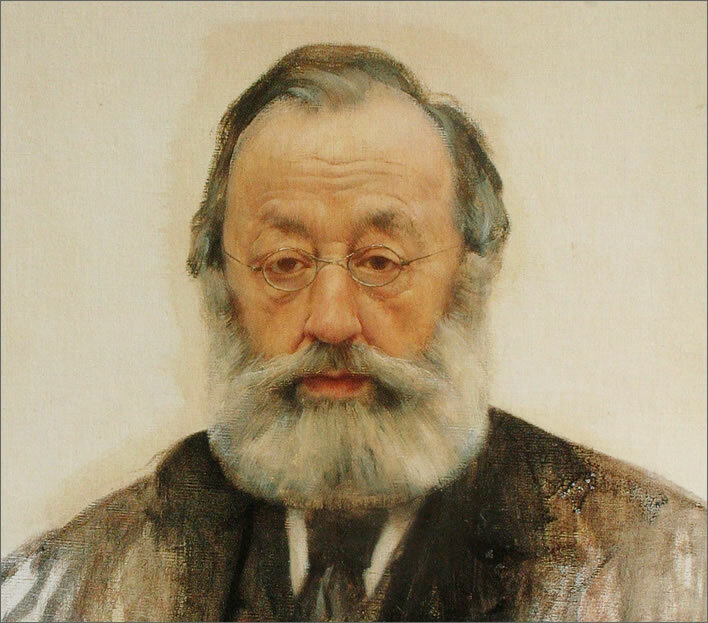 Gottfried Keller (1819-1890) painted by Karl Stauffer-Bern (1857–1891) in 1886. Image: Kunsthaus Zürich, loan from the Gottfried Keller-Stiftung, Zürich. The Swiss writer, poet, artist and politician Gottfried Keller (1819-1890) was a dreamer – not in the sense of 'fantasist', but someone who dreamed vividly and remembered his dreams in the light of morning. The memorable and colourful figures and scenes we find in his literary works owe much to the intensity of the dreams he experienced. …a young girl came and offered me a large bunch of carnations for sale. I was greatly surprised that there were carnations in December and haggled with the child; she wanted three shillings. However, I only had two in my pocket and was very embarrassed; I asked her to select two shillings-worth of flowers from the bunch, since only this many would fit into my champagne flute, which is where I usually put flowers. Then she said: Let's just see, they'll probably go in. Then she placed one carnation after the other in the narrow, lustrous glass thoughtfully. I watched her and felt that contentment and sense of well-being that always comes when someone carries out under our eyes a gentle task silently, calmly and delicately. As she placed the last carnation in the glass I became fearful once more. The girl looked at me in a friendly but crafty way and said: Can you see? There are not as many as I thought there were and the cost is only two shillings. They were not really carnations, but a fiery red, and the smell was extraordinarily pleasant and carnation-like. … ein junges Mädchen kam und mir einen großen Strauß Nelken zum Kauf anbot. Ich wunderte mich sehr, daß es im Dezember noch Nelken gebe, und handelte mit dem Kinde; sie verlangte drei Schillinge. Ich hatte aber bloß zwei in der Tasche und war in großer Verlegenheit; ich verlangte, sie sollte mir für zwei Schillinge von den Blumen absondem, indem nur soviel in meinem Champagnerglas, in welchem ich die Blumen gewöhnlich aufbewahre, Platz hätten. Da sagte sie: Lassen Sie mal sehen, sie gehen schon hinein. Nun stellte sie eine Nelke nach der andern bedächtig in das schlanke glänzende Glas, ich sah ihr zu und empfand jenes Behagen und Wohlgefühl, welches immer in einen kömmt, wenn jemand vor unsem Augen eine leichte Arbeit still, ruhig und zierlich vollbringt. Als sie aber die letzte Nelke untergebracht hatte, wurde es mir wieder angst. Da sah mich das Mädchen freundlich und schlau an und sagte: Sehen Sie nun? Es sind aber auch nicht soviel, wie ich geglaubt habe, und sie kosten nur zwei Schillinge. Es waren indessen doch keine eigentlichen Nelken, aber von einem brennenden Rot, und der Geruch war außerordentlich angenehm und nelkenhaft. 'Aus dem Traumbuch', in Sämtliche Werke, edited by J. Frankel und C. Helbling, Vol. 21 (1947), p. 80.